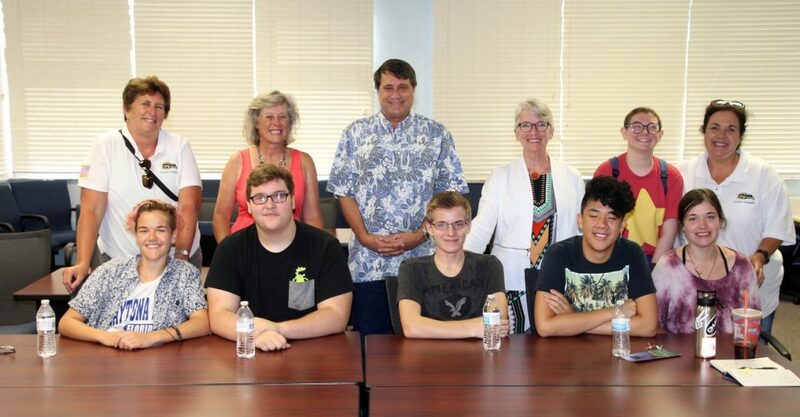 ST. PETERSBURG, FL – With inquisitive enthusiasm, six AP/Honors rising seniors from Sunlake High School visited the University of South Florida College of Marine Science Thursday, August 2, 2018. A long term friendship between Dr. Teresa Greely (USFCMS) and biology teacher Ms. Kathryn Bylsma (Sunlake HS) produced this opportunity for the students to take an in-depth, behind-the-scenes tour of CMS. Organized by the Office of Academic Affairs (OAA), with Sami Francis and Shelby Mahank serving as guides, the tour began in the CMS conference room, made its way through a research vessel docked behind the college, and finished with a walk through of several laboratories where the students received demonstration of some real-time research. The variety of scientific disciplines presented demonstrates the multi-disciplinary work that occurs at CMS. The first lab stop on the tour was the Marine Genomics Lab (Dr. Mya Breitbart), where graduate students Natalie Sawaya and Makenzie Burrows showed-and-told a few techniques used in virus hunting and fish egg DNA barcoding. Dr. Kristen Buck led the next portion of the tour, explaining trace metal biogeochemistry and giving Sunlake students a peak into the metal-free clean labs. Dr. David Naar brought the students into the wax-demonstration lab for the third tour stop and exhibited for everyone the fundamental mechanisms of plate tectonics using a hot-wax model that simulates the earth’s crust. Chris Sharp, with the Florida Institute of Oceanography, provided the thorough tour of the R/V Hogarth, and the welcome session was led by Dr. Naar, Dean Jacqueline Dixon, and Dr. Teresa Greely who shared a combined wealth of life experience that hopefully inspired the Sunlake HS students to think about what path, in science or otherwise, they might carve out in their own lives. Thanks to the science teachers, Kathyrn Bylsma and Beverly Shelley, for bringing the Sunlake students and for being excellent chaperones.